During my MRes course at the Center for Advanced Spatial Analysis and Visualization I had to prepare a map using ArcGIS. ArcGIS is a platform for designing and managing solutions through the application of geographic knowledge. After completing the basic tutorials and some explanatory practicals in the class I was able to perform a basic visualization for London. As a new resident in the city, trying to understand it’s size and various neighborhoods I came up with a simple idea; a map that could highlight the various sizes of the neighborhoods of the city. To perform this simple analysis I decided to use data for the Wards of London. Wards are electoral and political subdivisions that have been there since the medieval era. Their size is relatively small compared to the size of a Borough and their scale was ideal. Size in urban analysis can be a first indicator for many attributes of the area. 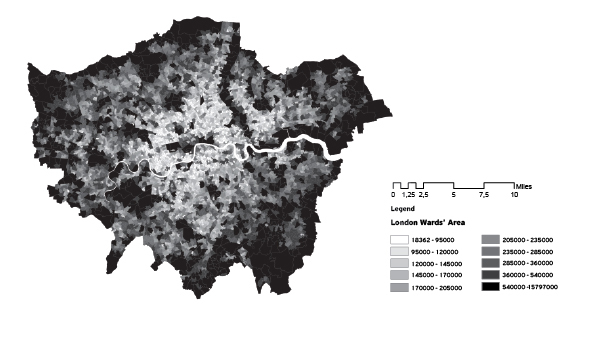 In the case of London the Wards get bigger as the distance from the center augments. This could be an indicator of the time that they were created or the density of the urban fabric. I used a gradient scale with 10 shades from black to white to create the final map. A comment that I got was that the human eye can only perceive differences in patterns within a range of six shades. I would like to update the map with additional information and a narrower gradient scale, when I find the time. For now the 10 shades make it look more complex than it is.